Count Taymurâz sat down at his desk, resting up on a raised platform overseeing the great library of Maaliline. Ancient scrolls, notebooks and crumbling tomes of various quality and dubious origin sat stacked upon his desk and in great heaps upon the floor and nearby shelves. Many with pages open and marked with a thin wooden disc for easy reference. On the desk before him lay open the work of his life (so far), the story of his people, and the history of Métismärle itself. It's pages still loose, waiting to be bound by the town bookmaker upon it's completion. The parchment having been made within Maaliline itself was the finest quality they could produce. It's pages first having been prepared with liquids that would aid it in it's longevity and make the ink adhere better to it's surface. Now long since dried and prepared for its use. Taymurâz flicked the soft cotton sleeves of his robe back up his arms and carefully clipped each one so they would not drag across the fresh ink. One of the library attendants carefully stepped up with a tray of inks. Different hues for the heading text and a nice solid ink for the main body of the work. Ink that would last the centuries. The tray also contained a variety of quills, cloths and pieces of wood for scraping, as well as stencils for finer details. "Time to begin." he says out loud, cracking his knuckles and settling into the job. The original name and location of the first settlers of Maaliline is lost in the passage of time. However descriptions are abound within their oral traditions of their distant past. Many centuries ago they lived in a hilly region, known for it's many travelers and as a crossroads of trade. The tribe was however very small, and consisted mainly of women and young men. The location also making it a place of regular conflict with other nearby tribes who sought to subdue them - and sometimes succeeding. They lived in simple mud and timber huts, eking a living from the land abounding and the trade and conflicts themselves about them. The Métismärle tribe was in all ways, a simple and rather nondescript Brudvir tribe. Ruled over by a small council of elders with no clear singular leader. However a woman stood out from the rest. Her name was Zrushir, and was in her own right recognised by the usually male dominated Brudvir. Her ability to craft bows of high quality, track and hunt, even fight when needed - all values the Brudvir admire - was well received by the tribe. An account by a Brudvir sage retells the story of the young Zrushir, hunting a bear that had slain her father and born away her mother. The bear was itself a powerful forest spirit who had come for revenge for her father breaking the laws of the land and slaying the bear cubs in the depths of winter. Zrushir hunted the bear and found it feeding her father's corpse to a new brood of bear cubs. Just as the previously slain bears had been used to feed Zrushir and her mother. It was in this moment that Zrushir realised that the spirits of all animals and Mann, did not merely exist, and have the right to exist. However she desperately wanted her mother back alive. Lowering her bow, she entered into the cave and peacefully approached the bear-mother and knelt before her. Zrushir reached out to touch the spirit of the bear with compassion and understanding, and the bear responded with the release of her mother, content that the balance had been restored. From this day onward the tribe learned from the example set by Zrushir and began to live more closely with the land and the animal spirits abounding them. She rose to prominence within the council, becoming a defacto chief of the tribe, while still maintaining their more democratic ways. The tribe under Zrushir had grown, continuing to attract foreign merchants and conflict alike as it always had. One evening a Neran man rode into the village, his face pale near death and sickly. His own horse, little different. The tribe in their ignorance took the man and his beast in and tended them until both had passed away mere hours later. Their corpses were burned, but it was too late. Over the days the plague spread, not only to the tribe itself, but across the land, infecting the animals that they had so closely bonded with, and the land itself grew sick and infected with the disease. Not only were members of the tribe dropping dead each day, but food had grown scarce. Word came in from nearby tribes that the plague had also struck them. The traders ceased coming and life rapidly became untenable within the village. 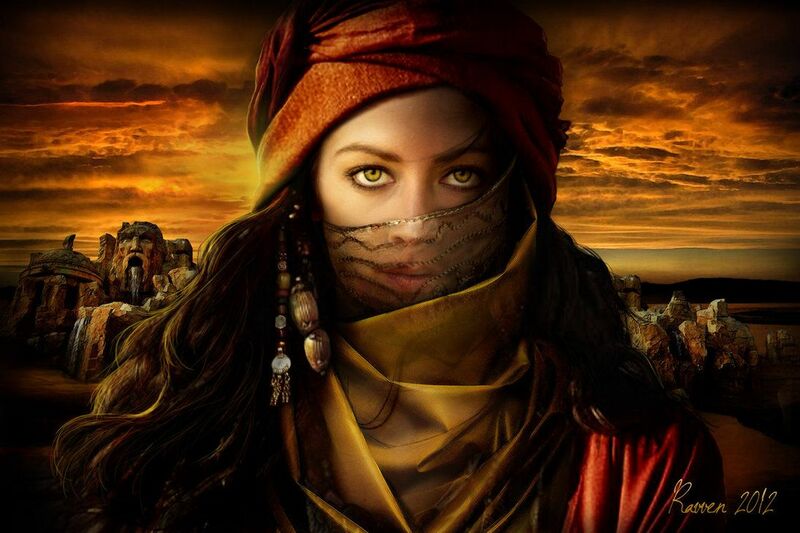 Then Zrushir herself fell ill. For days she languished under the plague, in her delirium she saw a great endless land of sand and rock and fire, and within it a being of dual light and darkness, reaching out to Zrushir to guide her path through the bleak landscape. Whether this was a genuine prophecy or merely a coincidental fever-dream we will not know for sure, and indeed even the tribe were skeptical by all accounts. However her fever broke a few days later and her plague-sores rapidly healed themselves. Not all of the plague-infected were dying. However the land itself still was. So Zrushir, now the leader of the few survivors of the Searing Plague, came up with a plan. The Tribe would for a time become nomadic, seeking a new land! The Métismärle people call the time of travel the "journey of ages". Indeed the journey was so long that it was the far distant descendants of Zrushir and her original people who 'completed' it. The oral traditions tell of a great journey through ancient forests, over mighty mountains through her lifetime alone. Always running from the Searing Plague and their own petty troubles. Seeking food, learning and living from the land at the same time. Initially they came to live in a land with the Kypiq. The two groups sharing similar religious views. The point of view that Zrushir had held since her encounter with the bear, helping to lead both her and the Kypiq elders to better understand and accept one another. The tribe was for a time safe with their Kypiq friends, however this was not the land Zrushir had seen within her fever-dream, and she managed to convince her tribe and a few of the local Kypiq to once again uproot themselves and head for the land of her vision. The tribe rapidly adopted the view that all living things held the spirits within them, and that it was the very spirits of the land who were punishing the tribes of Mann with the plague. They began slowly to adopt more communal and closer ways of living, more reverence for their food and shelter, as both were often in such short supply on the road. A Neran scholar apparently encountered the tribe, and wrote that the tribe had virtually become a religious cult in it's own right, attracting members of many tribes as they passed through townships and villages. The story of the tribal leader having survived the plague drew her followers. The communal and multicultural views of the tribe being well received in the darkest days of the plague. As they traveled they began to work with nurses, plague doctors and herbalists. Learning and developing the strict oral traditions that would carry some of this knowledge to the modern day. Nicely Written and love the accompanied artwork.